the Makerie: first friday at fancy tiger! first friday at fancy tiger! But for now, won't you come join us at this adorable, 'makes you want to make everything' shop in Denver this evening? 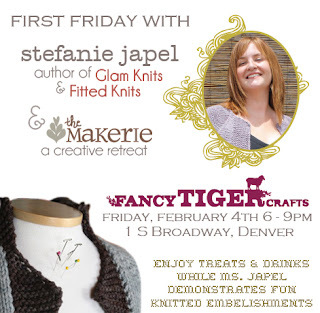 Stefanie will be there with a sneak peek of her knitting embellishment class she is offering at the Makerie. Did we mention wine & treats too? Come join us ~ won't you? Oh, how I wish I was local!